Atrosan is made from extracts of Devil's Claw, sustainably cultivated with a conscience in the Kalahari Desert. 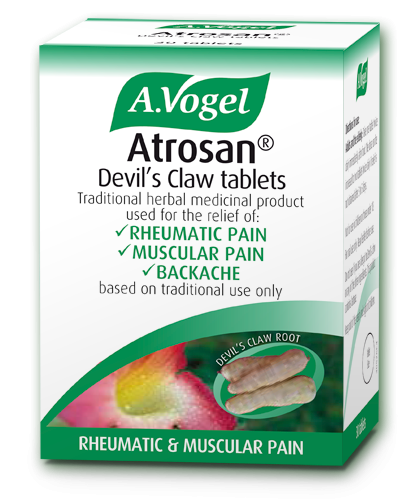 Atrosan Devil’s Claw tablets is a traditional herbal medicinal product used for the relief of backache, rheumatic or muscular pain, and general aches and pains in the muscles and joints, exclusively based upon long-standing use as a traditional remedy. Devil’s Claw contains a group of components known as iridoids which possess anti-inflammatory, antirheumatic and pain killing properties. The anti-inflammatory action has been shown to be equivalent to that of steroids, but the plant itself does not seem to contain steroids, which may be why it does not have the side effects associated with steroid use.